The Four-Leaf Clover series is a charming expression of happiness. The Four-Leaf Clover series is a charming expression of happiness. Amongst the three-leaf clovers you will always find a four-leaf, so it can be your lucky day everyday! 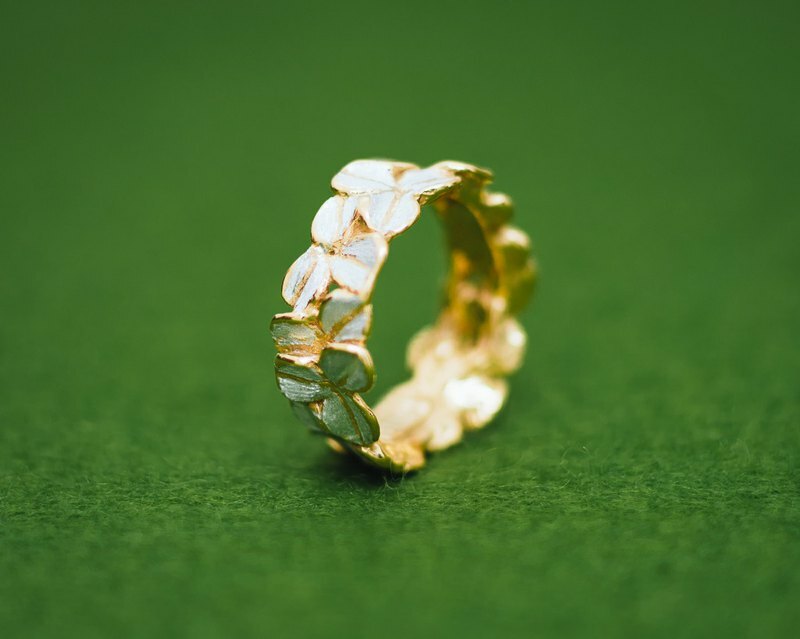 The ring is a simple line-up of clovers which circle the wearers finger. With a base of high purity silver and plated with 23K Gold, the gold has been partially scraped away to reveal the silver underneath. This delicate and intricate finish gives this Clover design its unique beauty. As this ring is not free-size, please specify your preferred ring size and we will make it for you. Production takes 2-3 weeks. Material: Silver/Gold Mix (Britannia Silver 958 base with 23K Gold Vermeil) Width: Approximately 6mm Please note: Model photograph shows the Silver version to show the size. This listing is for the gold & silver version. This piece is crafted in Britannia Silver 958, a high purity silver which retains its bright color (unlike sterling silver which tarnishes easily). We also provide a small zip lock bag in which we recommend to store your piece/s to keep them away from the air. This will help to keep them bright for a long time. ------------ We are a husband-wife, husband's-parents, and two-production-staff team. We make fun handmade, original pieces for fun people. Come visit our store if you're in lovely Tokyo. Thank you for looking!